With today’s agreement on a contract extension between the Toronto Blue Jays and R.A. Dickey, the Blue Jays have successfully upgraded every aspect of their roster. They have a new leadoff hitter and shortstop in Jose Reyes. They have a new left fielder in Melky Cabrera. They have competition at second base between Macier Izturis (the favorite) and speedster Emilio Bonafacio, who if he is not at second will serve as an upgrade to Omar Vizquel the former utility player. The National Cy Young award winner is just one piece of a dramatically updated starting rotation: Dickey, Josh Johnson, Mark Buerhle, Ricky Romero, and Brandon Morrow. The team retained Anthony Gose as insurance against the continued regression of Colby Rasmus. Brett Lawrie is back at third base and primed for a big season after the experience of the 2012 season. The only spot that you might consider upgrading but has not even been considered by the Blue Jays is designated hitter – where their former stud first baseman now resides. Not so long ago, Adam Lind was a top prospect and a player that oozed the potential that fantasy owners lust after. The Blue Jays selected him in the third round of the 2004 amateur draft out of South Alabama University. He performed very well in the minors, showing an ability to hit for both average and power. The Blue Jays took their time working him into the regular lineup. He worked as both a part-time designated hitter and left fielder. In 2009 he earned a fulltime role in the lineup and hit .305/.370/.562 with 35 homeruns which was right in line with projections based on his minor league performances. He began the 2010 season right where the 2009 season had ended. But in early May of that season he was placed on the disabled list with a back injury which has been a recurring problem ever since. He got off to a great start to the 2011 season hitting .339, with 15 home runs and 44 RBIs in 46 games until the back injuries hit him again. It seems reasonable to assume that the back injuries have affected his swing at times. In fact early in the 2012 season there was a point where he could not bend over because his back was that stiffened and inflamed. Yet, he was not on the disabled list and was being treated with anti-inflammatory medication. Chris Lund of The Hardball Times wrote an article presenting video evidence of the changes in his swing due to the back injury. He even suggests that the changes to his swing are causing the back injury to recur. On May 17th of the 2012 season, Lind was sent to the minors. He was batting just .186 with three homeruns at the time. Two weeks later he was taken off the 40-man roster. The Blue Jays claimed they wanted Lind to work with minor league hitting instructor Chad Mottola on regaining his stroke. They clearly stated that there was no timetable and that he would not be recalled until they were certain he had earned another opportunity. Lind played 35 games altogether in the minors during the 2012 season. He hit .545/.615/.818 in three games at the double-A level, and .392/.448/.664 in 143 plate appearances for triple-A Las Vegas where he worked with Chad Mottola. 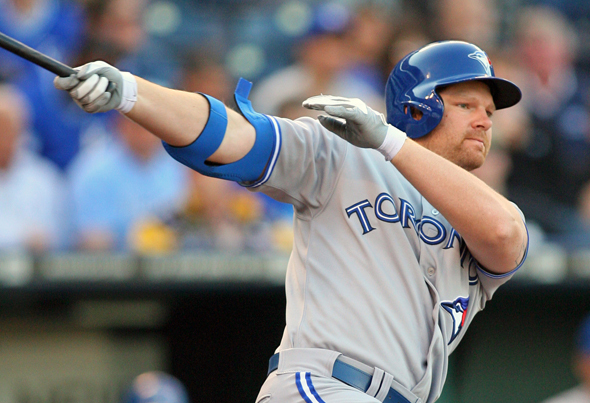 On June 24th the Blue Jays recalled Adam Lind to the major leagues. He was a different player at that point. Obviously Lind did not transform back into the masher of 2009 but he became productive once again with a wRC+ of over one hundred in each month since. The major difference between these numbers and 2009 is almost entirely in batted ball types (and another stint on the disabled list with back problems). Lind is hitting a lot more groundballs and infield flies. His HR/FB took a turn in the right direction but with Lind hitting so many balls on the ground it does not show in his homerun total. However, if Lind does nothing but maintain his swing and this type of production he could hit 20-25 homers with a solid batting average. The key to Lind’s productivity is health. If he can stay off the disabled list and do the necessary stretching and exercise to both stay in shape and prevent his back from tightening it could help him put up numbers more in line with his potential. There is some hope that the big changes to the Blue Jays roster this offseason will serve as motivation. Adam Lind is no longer the young guy that’s been there the longest. He does not have to be the veteran presence or protect anyone in the lineup or even play defense. All he has to do is hit and until the last couple of seasons he had done that very well his entire life.